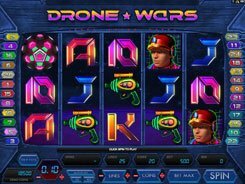 Released by Microgaming, What on Earth is a sci-fi themed slot with lots of entertaining features to keep you at the edge of your seat. 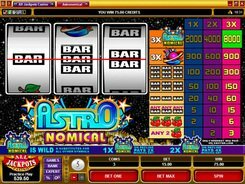 The slot has 5 reels, 9 paylines, a wild, three scatter symbols and two bonus games. A coin size is customized from $0.01 to $2, with up to 5 coins permitted per line. Therefore, the minimum and maximum wagers you can place per spin are $0.01 and $90. 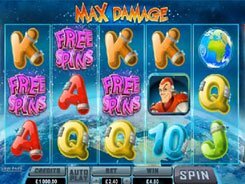 Very simple graphics give a classic appeal to the slot, but an array of amazing features makes it great fun to play. 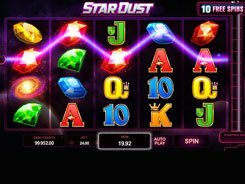 The slot has a wild symbol that pays out the top jackpot of a massive $75,000 for five of a kind. The only downside about the wild is that it substitutes for only two symbols. 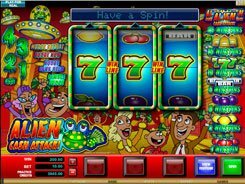 The Beam ‘em Up bonus feature is triggered by landing three red, green or blue rockets on adjacent reels. If this happens, a new screen will show a night city and five flying saucers hovering in the sky. 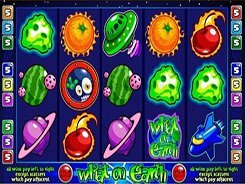 Your aim is to pick one of the saucers that would reveal a multiplier that will then be applied to your total coins bet. Another feature called the Destination Bonus and unlocked by one Globe symbol can award a win of up to x400 times a bet.